This customer stood out at my booth at the craft market in Rostock. The old man in the wheelchair looked like a real captain: a sailor cap, a blue jacket with gold buttons gleaming, thick eyebrows, a white beard, and a windswept face. He did not seem satisfied. “You don’t have a sailor,” he muttered, his gaze wandered searching through my work. “But there is the ‘Passat’ anchored at Travemünde.” – “A four master is good, but if you are going do one, do it on the high seas!” – “Oh, that will be difficult,” I said. Actually, I had the word ‘impossible’ in my head. 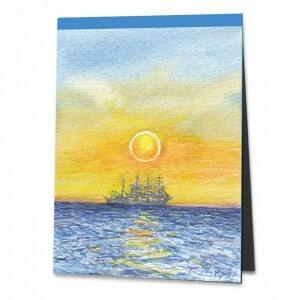 For how and where could I paint a sailing ship? The evening was as beautiful and summery as the day. After the market closed, I drove to the coast to watch the sunset in Wustrow. With my painting bag over my shoulder, I strolled along the pier and suddenly saw a grey spot on the horizon. I squinted: too big for a cutter, too tall for a freighter – and, hang on, were there masts as well? That had to be a sailing ship! If so, then there was not much time. The sun was already setting, the ship slid forward, and immediately I rushed over the squeaky wooden planks toward the pier head. The fishermen threw me sullen glances: so much excitement, what on Earth for? I quickly dug into my bag to grab my painting things. The sky shone and the sea sparkled in the yellow sun. But this gray outline was too small, I could not distinguish the lines of the vessel despite my best intentions. My hand went into my trouser pocket. Had I not just heard the jangling of change? To my delight I drew out a hand full of coins, ahh yes, the change from the market! All one-euro pieces, with which I could now feed the telescope beside me. Finally, I saw the ship, saw its shape, its masts. One coin after another disappeared into the apparatus and like the four master I also sailed suddenly with a good breeze. Money in, slot up, a look through the telescope, a look at the colors, strokes on the paper, another look through the telescope, slot down, more money in ... the picture took shape, while the earth turned, the sun sank and the ship sailed to the east.